I recently picked up a dress from the tailor. When I dropped it off to be altered, the dress was at least two sizes too large with the waist nearly at my hips and the bodice hanging loosely off my torso. When I picked it up, I tried it on so the tailor could see that it fit. I felt absolutely lovely. So as soon as I got home, I put that dress back on. And I wore that lace bridesmaid dress around my house for over an hour. I posed for pictures in front of my little tripod. I sat and smiled at myself in the mirror. I twirled. And on an emotionally rough day, I felt better. As a woman, I know that the world places a lot of my value in my appearance. I also know that’s not where my value truly lies. But I also like to like the way I look. When you like the way you look, you feel better about yourself. You’re more confident. You have better posture too. 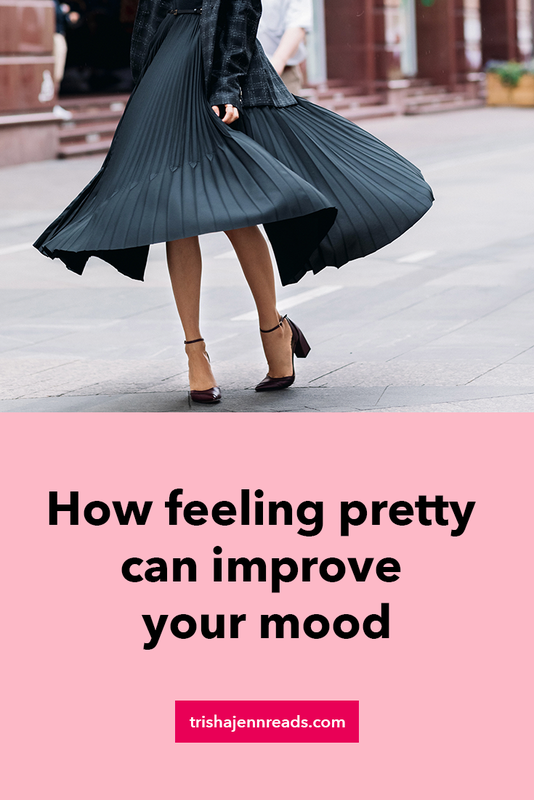 Liking the way you look, feeling pretty, can have a huge emotional impact on a person. That’s why so many of us take selfies, why we post them on our Instagram or send them to our friends with the caption, “I feel pretty today” or “I love my outfit today” or “Having a good hair day!”. Positive body image directly impacts self-esteem, which impacts mental health. So if you’re feeling down today, go put on something pretty that fits your body well (it doesn’t have to be a bridesmaid dress) or do your hair or put on some lip gloss. Do whatever simple thing you need to do so that you can look in the mirror and smile at yourself and say “I feel pretty today”. I work from home. I have up days and down days. Some days I feel great. Other days, I’m sad and missing my angel babies. But every day, I aim to get dressed and do my hair. Sometimes it’s simple: jeans, t-shirt, ponytail. Other days it’s a little more elaborate: complete outfit with jewelry, makeup, curled or braided hair. Either way, unless I’m physically sick, I get dressed to make sure I feel pretty. Before I sign off today, there’s one other little thing. As important as it is for me to feel pretty, it’s also important for me to do what I can to make sure my lady friends feel pretty too. A compliment can go a long way in helping someone having a rough day. And it takes nearly no effort on my part because each of my friends are absolutely stunning women. They are strong and smart, wise and kind. Many of them are amazing mothers full of love for their children and for the other mothers around them. So when I see my friends and when I come across the selfies they post on social media, I tell them the honest truth: how pretty they are. I choose to compliment my friends’ beauty – their eyes, hair, outfit, smile, makeup, whatever catches my eye that day – to remind them that even when they don’t feel pretty, they are. Never underestimate how feeling pretty can lift a woman’s spirits. I agree! Let’s wear beautiful fabrics and harmonious colours and symmetrical lines! Let’s accessorise with lace and braids and chains. I dress up for church because I like one day of really fancy in my week. Many times in an everyday week people ask where I’m going so fancy, so it’s all relative. Colour is improtant. I don’t think very hard about it, but I know I’m angry when I wear red more than two days in a row!